The urinary system is a bodily system responsible for producing, storing, and secreting urine (waste). It includes the kidneys, urinary bladder, urethra, and ureters. It also serves several important roles other than filtering out wastes; including maintain the water levels in the body, and control blood pressure and pH levels. After taking nutrients and vitamins from digested food and converting it to energy for the body to use, certain waste materials are left behind that need to be excreted from the body. Waste materials, both solid and liquid, are left in the bowel and in the blood. 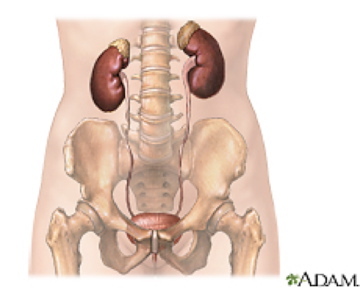 This is where the urinary system comes into play. Urea, which is the primary waste removed by the kidney, is the result of the breakdown of foods and vegetables that have protein. The urea is carried by the bloodstream to the kidneys where the filtration process begins. 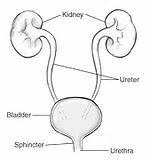 The urinary system is a critical system in the body. The average adult excretes almost a quart and a half of urine per day, which varies depending on the amount of liquid consumed. This waste must be removed from the body and the urinary system provides that mechanism. If kidney failure occurs, death will usually result in 2-3 days. The main organs of the urinary system. Urine formation is the main function of the urinary system. There are four general steps of urine formation. Urine formation first starts with filtration. This is when fluid will exit the blood and go through a filtration membrane so it can be carried to the lumen of the Bowman's capsule. Filtration takes place in the glomerulus, therefore calling the process, glomerular filtration. The role of the filtration membrane is to prevent blood cells and proteins from leaving the blood vessels. This way, the blood fluid and its non-protein contents are the only substances that enter the nephron. The blood fluid with its non-protein contents is called filtrate, and is very similar to blood plasma, with the exception of no proteins it can be found in the nephrons of the kidneys. The filtration process is strictly to prevent the blood cells and proteins from leaving the blood vessels. The filtrate that circulates through the filtration barrier carries both good and bad chemicals. These chemicals flow into the proximal tubule of the nephron. Even though now, the filtrate is located in the functional unit of the kidney, it is still not the same substance as urine. When the filtrate enters the proximal tubulue, the fluid is technically still the same as interstitial fluid. Here is a video of the urine formation process. The interior of a kidney when kidney stones are formed. Urinary Incontinence: Urinary incontinence is the complete loss of bladder control, meaning someone who suffers from incontinence can maintain no control over when they urinate. The male or female possesses no control and the urination process becomes involuntary. Various types of urinary incontinence exist and several causes lead to incontinence, however, there are various treatments available. Treatments such as exercises and surgery are available for those suffering from urinary incontinence. This ailment is typically found more in women than in men. ↑ 1.0 1.1 1.2 Anatomy of the Urinary System The Ohio State Medical Center, 2007. ↑ 3.0 3.1 3.2 3.3 The Urinary System National Cancer Institute, 2000. ↑ 5.0 5.1 5.2 5.3 5.4 5.5 Your Urinary System and How It Works National Institute of Diabetes and Digestive and Kidney Diseases, 2007. ↑ Urinary Tract Infections Medline Plus, 2011. ↑ Kidney Failure Yahoo! Health, 2008. This page was last modified on 7 January 2016, at 18:28.